Today, you are a member of... Boom for the Wow - You Are A Member! Sure, when the word rocketry comes to mind, it’s easy to automatically preceed it with the word modern and imagine machinehead stand-ins for dystopian a(na)tomic ill-will, all tricked out 2001: A Space Odyssey style. But the technology that gets thrust from reaction is something we Modernistas actually dredged from the 13th century China. 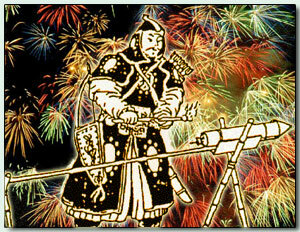 And yes, they too used the the ‘fire-dragon issuing from water’ as science with which to get their war on, but they also reserved a bit of boom power for amusement in the form of fireworks. Good to remember, members; war and entertainment are the flip sides of same coin. This week, make sure your pyrotechics are clearly marked.